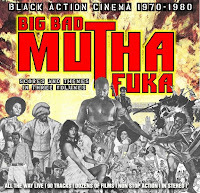 First Volume of what is without doubt the best Blackexploitation music compilation ever. These were lifted from the now deceased RecordBrother blog. It was one of the first blog I discovered and the owner seemed every bit as ecclectic as I am. I was lured there by a search for Movie Biker Music. Sadly, the owner had already pulled his compilation off… Anybody has it? Drop me a line! If it is of the same quality as his Blackexploitation comps, it must be the MOTHER of all 70's Biker Movie comps. Reward given to anybody who can shift it my way - end of disgression. RecordBrother was obviously a DJ and these 70's Black music were pulled from his tape comps, that means there no info on song title/artist or movie the dialogues were taken from. That's where my little contest kicks in: Identify all tracks in this comp, complete with artist's name, song title (or movie name) and I will give a free Premium Rapidshare account for one month. You just need to leave your findings in the comments section of this post… be sure to ID yourself as I can't give the prize to A. Nonymous… Drop me your email (I won't publish it). It gets better: there are three volumes in all in this series and they all suffer from the missing info. The contest will be reconducted for each volume. Even more: if somebody finds ALL song info on all 3 VOLUMES, I will offer you a ONE-YEAR Premium Rapidshare account. If not all info is found, the participant with most correct answers will win the final prize. A Premium Rapidshare account is vital if you like the blogs listed on the right. This type of account will allow you to download without restriction and without waiting time as many albums in parralel as you 'puter will stand. For example, DLing all of rideyourpony's post will take you more than a month…full time! EXCELLENT compilation....but very difficult to find all the titles. I hope and I wish to find them. I'm waitinf for the other 2 volumes. I din't know the RecordBrother Blog was gone. I got this set a couple of years back, and like everyone else have been frustrated by the lack of a track list. Kudos to you for this brilliant idea of such a contest! I surely hope it brings about some results! Keep this set alive! It is a worthy collection to have for any music fanatic!